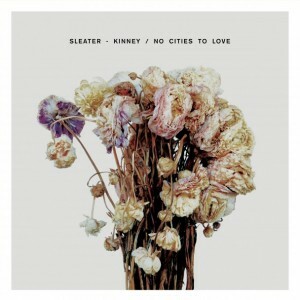 One of the major highlights of 2015 so far has been the release of Sleater-Kinney’s eighth album, No Cities to Love, after their nine-year hiatus. If you have not yet heard it, stop reading right now and go find it. Seriously. It’s just a bit over 30 minutes long; you could listen on your lunch break or your commute home. Not only is the record musically brilliant, but the reunion of these three performers amounts to a cultural milestone for my generation: Sleater-Kinney is back, and they’re at least as good as, if not better than, ever. With a new record, of course, comes the tour, and those fortunate enough to have snagged tickets to one of their upcoming shows at the 9:30 Club in DC, the band’s “favorite music venue,” should be in for a treat. There’s hope for the rest of us too, though, as NPR has announced that they’ll be streaming a live video webcast of Sleater-Kinney’s set at, appropriately enough, 9:30 pm ET tonight. I can’t wait to hear the new songs live. It’s been a long time since these ladies rocked out together, and while I’m curious to see what old tunes they bring back, No Cities to Love has enough great songs to carry a show. You wouldn’t necessarily guess that a “reunion album” would be so electrifying, so well put together yet seemingly effortless, but this one absolutely is. There is nothing watered down about these songs, and Sleater-Kinney runs zero risk of slipping into nostalgia act territory. With vocals that are just as urgent and vital as ever and instrumentals so energized that they leave you tingling, this record is a declaration, an announcement that since the throne they abandoned still sits vacant, Brownstein, Tucker, and Weiss are more than ready to reclaim it. “We want the songs to be daunting,” Janet Weiss says on SubPop, and they are. It’s clear on the tracks that the three are incredibly strong, skilled musicians, that their absence left a musical hole that couldn’t be filled by anyone else, and that we needed them back. A definite departure from the fuzzed out classic rock homage that was The Woods, No Cities to Love reminds me at times of All Hands on the Bad One; there are hints of power pop, there’s a focus on choruses, and the songs are catchy. But this is absolutely a new story. There’s something a little stony, a little edgy, in this one, like it’s glaring at you. From the beginning notes of “Price Tag,” you know unequivocally who you’re listening to, though these riffs sound fresh and unique. An explicitly political song, a challenge to status quo consumerism, to a stagnant economy in which we’re inundated with products but have no way of paying for them, it’s a narrative of the unintended consequences of a life built around consumption, an indictment of working so hard for so many things. It’s also a hell of a way to launch a comeback. “Surface Envy” is another powerhouse, a rockin’ tribute to being a band again, with some cool staircase-y riffs. It’s got a great spirit and is easy to love. On a record with a lot of good choruses, this is one of my favorites. “We win, we lose. Only together do we break the rules. We win, we lose. Only together do we make the rules.” This song is an expression of the band’s self-consciousness; they know they are singular, that there wasn’t ever before and won’t ever be a band like them. They were pioneers, and now they set the standard. The title track is just a fun song to sing and rock out to: “It’s not the cities, it’s the weather we love.” The slowed down, enigmatic verses build to a head-nodding chorus, and then there’s that part near the end about the “void in me.” Who knows what it means, really? Since Weekend Review Kit is at this moment attempting to make a decision about relocation and were advised to choose a city based on weather, we kind of think it’s about that. My favorite song on No Cities to Love is, I think, “No Anthems.” An intense listening experience all around, the resounding drums pound out a message right away. If you thought you could mess with these women, think again. The grinding, almost grating guitar soloing against the industrial-sounding background give this song a weight and power, the backbone to stark vocals that slink through verses into a bursting chorus. “Bury Our Friends” is another pretty amazing piece. With Tucker and Brownstein taking turns on angry verses and belting the chorus together, it feels like classic Sleater-Kinney. But a heavy darkness is carried over from “No Anthems” to this track, its anxiety over our society’s skewed priorities apparent: “we live on dread in our own gilded age.” The official video plays with this creepiness, featuring Miranda July masked, with white hair and beard, looking like she’s about to perform a funeral dirge with Bread and Puppet Theater. There’s a lot going on with these songs, a lot to think about, but plenty to dance to as well. I’ve given this a lot of thought, and it was hard for me to choose one strain. So, I’ve concocted a makeshift hybrid to match the mood and mojo of Sleater-Kinney. Start with RudeBoi OG, a cross between the dirty South’s sour-tasting Irene OG and WRK’s darling, Face Off OG. As the name suggests, RudeBoi OG is a nice choice for dancing, and it’s a perfect stress reliever. It should help you harness a punk attitude but keep you mellow enough that you’re not tempted to break any windows. A balanced hybrid, it has a deep, dank flavor that comes through well in a joint. Next you’ll need some Girl Scout Cookies. This super sweet strain, a fusion of OG Kush and Durban Poison, has become enormously popular lately and secured its position as a favorite on both coasts and most places in between. It’s sativa heavy from the DP and will definitely set your head spinning, but the hybrid action of the OG Kush provides waves of relaxation throughout your body. Great for a party, GSC will liven the mood of any room. Grind up a good amount of both the RudeBoi OG and the Girl Scout Cookies. Mix together in equal portions, sprinkle in as much as the paper can handle, and roll yourself a spliff for this momentous occasion. I’m calling the blend Riot Grrrl’s Daughter OG, and it’s dedicated to the complex, boundary-shattering music and legacy of Sleater-Kinney. We’re so glad you’re back! Posted in Arts & Literature, Reviews, Strains and tagged all hands on the bad one, bury our friends, carrie brownstein, corin tucker, girl scout cookies, janet weiss, miranda july, no anthems, no cities to love, price tag, reunion album, riot grrrl's daughter OG, rudeboi OG, sleater kinney, subpop, surface envy, the woods.